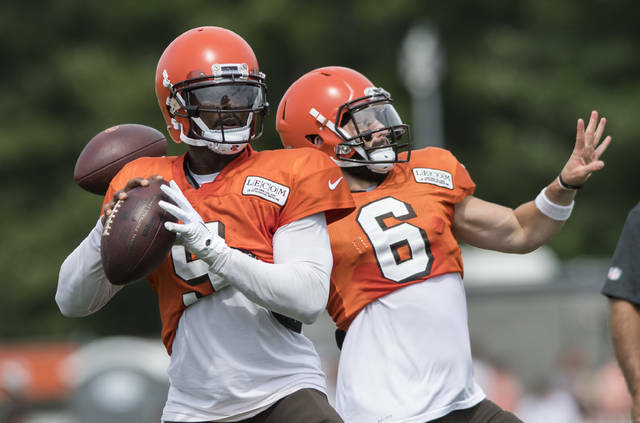 New faces: GM John Dorsey, QB Tyrod Taylor, WR Jarvis Landry, RB Carlos Hyde, LB Mychal Kendricks, DB Damarious Randall, QB Baker Mayfield, CB Denzel Ward, LT Austin Corbett, RT Chris Hubbard, WR Antonio Callaway, TE Darren Fells, DB E.J. Gaines, WR Jeff Janis, DB Terrance Mitchell, DL Chris Smith, QB Drew Stanton, CB T.J. Carrie. Key losses: LT Joe Thomas, RB Isaiah Crowell, QB DeShone Kizer, NT Danny Shelton, CB Jason McCourty, CB Jamar Taylor, WR Ricardo Louis. Strengths: Taylor led Buffalo to first playoff appearance in 17 years last season. He gives Cleveland experienced, competent starter to serve as bridge until Mayfield’s ready. Landry’s 400 receptions are most in league history for player in first four seasons. Three-time Pro Bowler, plus Josh Gordon and Callaway, provide Taylor with multiple downfield targets. Kendricks has been added to deep linebacking unit that includes Jamie Collins and Joe Schobert, Pro Bowler last season. Myles Garrett, top overall pick in 2017, had seven sacks in 11 games as rookie and could be on verge of major breakout. Weaknesses: Retirement of Thomas left enormous hole on left side of line. After trying other options early in camp, team moved elite left guard Joel Bitonio to tackle — where he hasn’t played since college. Bitonio has been replaced by Corbett, a rookie who played tackle at Nevada. Cleveland’s offensive line lacks depth and any injuries could be devastating. Fantasy Players To Watch: WR Gordon, RB Duke Johnson. If he stays sober and active, Gordon still has potential to be one of NFL’s best players. Gordon has incentive to get bigger contract, and new offensive coordinator Todd Haley will find ways to get him ball. Johnson has developed into one of league’s best dual-threat backs and caught 74 passes last season. He joined Herschel Walker as only backs with 500 yards receiving in each of first three seasons. Vegas Says: Super Bowl 100-1. Over/under wins 6. Expectations: After going 1-31 past two seasons, nowhere to go but up. 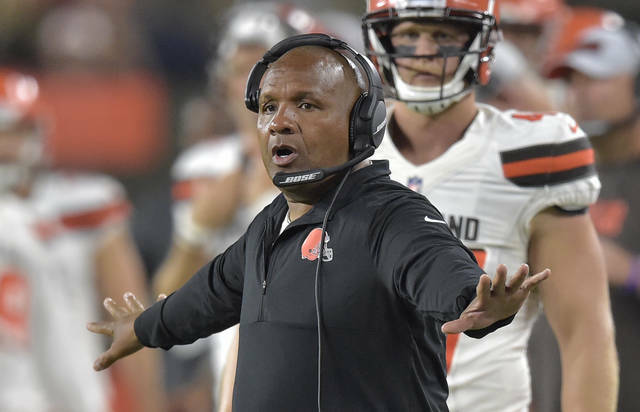 Coach Hue Jackson begins season on hot seat and needs to win couple early games to take heat off. Decision to play Taylor over Mayfield seems wise at start, but things could change by midseason if Browns struggle. Jackson has given up play-calling duties to Haley, who could replace him if Browns begin poorly and ownership makes change. Defense has potential to be really good, and must force more turnovers; Cleveland had league-low 13 takeaways in 2017. Schedule is rough with opener against Pittsburgh and four of last six games on road. 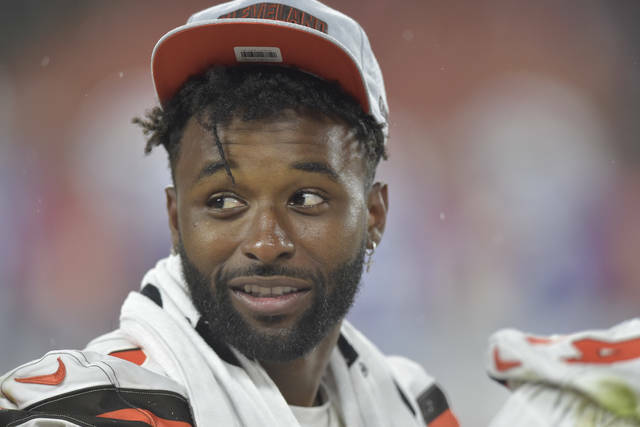 CLEVELAND (AP) — Jarvis Landry has heard the horror stories. Since being traded by the Miami Dolphins to the Browns in March, he’s been schooled on the misery, heartache and pain endured during a 0-16 season in Cleveland. Landry’s sympathetic — to a point. However, thanks to an extreme roster overhaul orchestrated by new general manager John Dorsey, who previously revived the Kansas City Chiefs, there’s reason to think the Browns will not only be better than a year ago — they can’t do any worse — but they’ll contend in the AFC North. There were no ups last season when the Browns joined the 2008 Detroit Lions in ignominy as the only teams to whiff on a 16-game schedule. That calamity came after the Browns went 1-15 in coach Hue Jackson’s first season. Yet despite his 1-31 mark, Jackson survived. Owners Dee and Jimmy Haslam pardoned him and are giving the fourth coach they’ve had since taking over in 2012, a third season to awaken one of the league’s most storied franchises. Jackson’s role is more CEO than coach this season after handing off the offense to former Steelers coordinator Todd Haley, who will call plays and try to get the most out of Taylor, a talented receiving group and three-back rotation featuring the versatile Duke Johnson. The Browns have spent most of the past 20 years looking for a franchise quarterback, and the team feels they’ve found one in Baker Mayfield, the Heisman Trophy winner drafted No. 1 overall. In the meantime, Taylor’s work ethic and positive attitude is influencing teammates who are starting to believe the bad days are behind the Browns. Garrett is quick, explosive and strong. And don’t be fooled that he’s soft-spoken or enjoys writing poems. The dude is nasty. Make no mistake, Jackson needs to win. He’s been given a pass because of previous mistakes made by the front office during the Browns’ rebuild. Now, Jackson has to show he can develop talent, manage games and produce victories. He’s running out of time. The Haslams have been supportive, but their backing could erode quickly if Cleveland doesn’t show major improvement in the first few weeks. Gordon’s speed stretches defenses, forcing them to respect the Browns’ deep passing game and creates openings elsewhere on the field. Gordon can make Landry, a three-time Pro Bowler, even more dangerous — and vice versa. Joel Bitonio didn’t want to do it, but the Browns slid the standout guard into Joe Thomas’ old spot at left tackle during camp. Thomas retired following 10 Pro Bowl seasons, leaving the Browns to address a position they didn’t have to worry about for a decade. Bitonio played some tackle at Nevada and while he’s not built like the prototypical end blocker, he’ll hold his own. Turnovers were a major reason for the Browns’ ruinous season. Not only did they commit a league-high 41 (28 interceptions, 13 fumbles), but Cleveland forced just 13 takeaways (seven INTs, six fumbles), the league’s fewest.